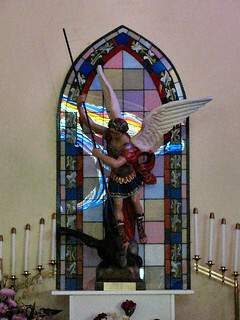 Saint Michael the Archangel is recognized for being the guardian and protector of God's church and people. While traveling through the town of Netcong on September 14, 2009, I stopped into The Church of St. Michael to say a prayer and took some photographs of the beautiful display of stained glass windows. The Catholic church is located in Morris County, New Jersey. Perhaps the most remarkable photograph is of Saint Michael with stained glass behind the statue, which gives the appearance of being a window. In order to capture the colorful rainbow that miracuously appeared on the stained glass behind the statue, I photographed the image without using a flash even though lighting was dim. The only inflowing light was from some church windows nearby - best described as faint. I believe inflowing light from Our Lord caused the colorful rainbow. Whatever the case, it is an interesting phenomena. If you examine the above photograph closely, it appears as if Michael the Archangel is creating a trail of rainbow colors as he lands on top and crushes the head of the serpent. In addition, Rays of God's light is also creating a distinct shadow by the arms of the statue. Furthermore, I did not observe any indoor lighting that might create such an effect, since church lights were turned off. I must say that our Lord indeed works in mysterious ways to affirm His presence. After the photograph was taken, I shared the image directly as captured on the camera's digital memory card with my spiritual advisor, Father Richard Tartaglia of Saint Mary's Church, Denville, NJ. The original digital image was transfered onto a CD for church archives. I also gave a copy of the CD to the youth minister at The Church of Saint Michael for their records. The following biblical prophecy is noted in Daniel 12:1, 3-4: "At that time there shall arise Michael, the great prince, guardian of your people; It shall be a time unsurpassed in distress since nations began until that time. But the wise shall shine brightly like the splendor of the firmament, And those who lead the many to justice shall be like the stars forever. As for you Daniel, keep secret the message and seal the book until the end time; many shall fall away and evil shall increase." In Revelation 12:7 and 8 the following is noted: Then war broke out in heaven; Michael and his angels battled against the dragon. The dragon and its angels fought back, but they did not prevail and there was no longer any place for them in heaven. The Prayer to Saint Michael is a prayer, used mainly by Catholics, which is addressed to Michael the Archangel. "May prayer strengthen us for the spiritual battle that the Letter to the Ephesians speaks of: 'Be strong in the Lord and in the strength of his might' (Ephesians 6:10). The Book of Revelation refers to this same battle, recalling before our eyes the image of St Michael the Archangel (cf. Revelation 12:7). Pope Leo XIII certainly had this picture in mind when, at the end of the last century, he brought in, throughout the Church, a special prayer to St Michael: 'Saint Michael the Archangel, defend us in battle. Be our protection against the wickedness and snares of the devil...' Although this prayer is no longer recited at the end of Mass, I ask everyone not to forget it and to recite it to obtain help in the battle against the forces of darkness and against the spirit of this world." Regarding prayers to angels, Revelation 8:3-4 says, Another angel came and stood at the altar, holding a gold censer. He was given a great quantity of incense to offer, along with the prayers of all the holy ones, on the gold altar that was before the throne. The smoke of the incense along with the prayers of the holy ones went up before God from the hand of the angel. Angels do indeed intercede before the throne of God on behalf of all who pray for God's assistance.